Don and Leatherhead run through the cave and come out the other side, where they spot a gorgosaurus about to munch on their friend Emur. The guys escape the strange dinosaur by fleeing into a maze of tar pits. Emur manages to discover a path out, but as soon as they’re on solid ground, the guys find themselves facing a stampede of triceratops. Fortunately there are vines nearby and our heroes use them to swing out of harm’s way – but no sooner do they think they’re safe than Emur is captured by a carnivorous plant. LH and Don beat the plant into submission and the three head out, eventually coming upon a beach. As they approach what seems to be an ocean, Don spots the spaceship that dropped them off flitting about the sky, but it disappears as quickly as it appeared. The guys build a raft, determined to cross the underground sea. Once the work is complete they set sail, but their craft is destroyed when they’re run into a raging storm. The protaginists grab the mast and float, when a gigantic prehistoric sea turtle arrives and begins to carry them safely away. Suddenly, a huge gator erupts from the ocean and approaches with ill intent. 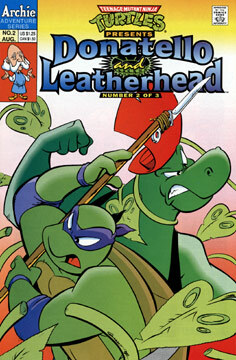 Leatherhead stands up to his prehistoric ancestor and oddly enough, it turns tail and leaves. Soon after, the sea turtle approaches an island and lets our heroes off on the beach. Sure enough, no sooner do they bid farewell to the giant turtle than they attacked yet again, this time by pterodactyls – one of which grabs LH by the ankle and carries him skywards. Before Don or Emur can react to this, they are set upon by armed Amazons who are riding winged horses.